However, a few months ago a guy at Giddy sent me some climbing salve to review. This caused me to think a little bit more about what is inside this kind of material. Climbing can be really hard on your hands. The more time you spend gripping rock and dipping chalk the more dried out and callused your hands get. This doesn't bother everybody, and there are a lot of people out there that don't use any kind of salve to treat their calluses, cuts and splits in their skin. But some of us are bigger babies than others and we need some kind of lotion or salve to keep our hands from coming apart at the seams. Beeswax, which is produced by female worker bees at a 10:1 honey to beeswax ratio (meaning it takes 10 pounds of honey to product 1 pound of beeswax), is primarily used in skin care products to bind, or emulsify, the oil components of cosmetic recipes. 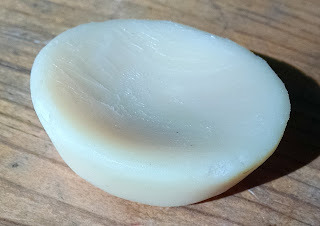 However, due to wax esthers found in beeswax that are similar to those found in human skin cells, beeswax has a wide variety of skin benefitting properties all on it’s own outside of the oils it binds together. First and foremost, similar to how beeswax is used as a protective agent for cloth, lining, and leathers, beeswax provides protective properties for your skin as well. Also, high in Vitamin A, beeswax helps penetrate skin and retain moisture without the risk of clogging pores. My hands tend to get trashed in different ways, primarily based on the type of climbing I'm doing at any given time. My palms and finger pads get trashed when I'm sport climbing, and the backs of my hands and fingers get seriously beat up when I'm trad climbing. Occasionally, on longer climbing trips, my hands don't heal very well... There is absolutely no doubt in my mind that the Giddy Climbing Salve increased the speed at which my skin healed and decreased the pain of split skin. There are several scents to the salve. They include cedar mint, cooling mint, lavender, sweet orange and unscented. The unscented version is also vegan friendly. And though some of the scents were quite nice, I didn't care for the sweet orange. I would recommend that you smell these, if possible, before ordering as this will be an issue of personal taste. I didn't do any type of scientific comparison between different skin salves or balms. Instead, I just used this particular brand non-stop on a week-long climbing trip. There may be other good products out there, but Giddy works, and it works well...!